Granary Flat01263 715779work01603 870304fax Self-cateringThe Granary Flat has been recently renovated, comprising part of a farmhouse dating from the 1600s, in the lovely village of Little Walsingham. Providing furniture of high-quality, tasteful decoration and modern, easy-to-use utilities, this property forms a great base to return to after a long day out exploring the Norfolk countryside. The property is comfortable and has an aesthetic of tranquility and ease. 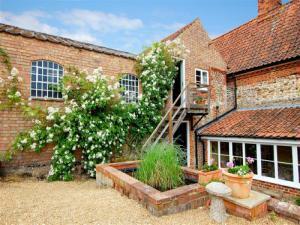 The Granary Flat has been recently renovated, comprising part of a farmhouse dating from the 1600s, in the lovely village of Little Walsingham. Providing furniture of high-quality, tasteful decoration and modern, easy-to-use utilities, this property forms a great base to return to after a long day out exploring the Norfolk countryside. The property is comfortable and has an aesthetic of tranquility and ease.